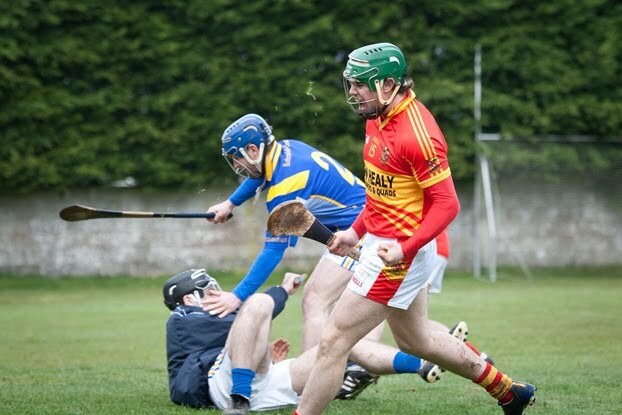 Moycarkey-Borris had a comprehensive eleven point victory over near neighbours Boherlahan-Dualla in The Ragg on Sunday afternoon in the Centenary Agri Mid Senior Hurling Championship. Played in blustery conditions, Boherlahan had the aid of the strong cross-field wind in the first half but it was Moycarkey who started the game in dominant fashion. Within two minutes of the throw-in, a good hand-passing move involving a third of the team saw the ball end up in the hands of Rory Ryan who dispatched the ball to the net. Following this positive start, Moycarkey pushed on with a high tempo game which forced Boherlahan in to numerous errors. From these errors, Moycarkey picked off their scores with impressive accuracy to race in to a 1-7 to 0-0 lead after 20 minutes. Boherlahan eventually got off the mark with a Darragh Hickey free in the 21st minute and this brought an improvement in their general play. This improvement did not result in additional scores until Boherlahan earned a penalty in the 28th minute. Darragh Hickey hit a rasper of a shot towards the top of the goal but Moycarkey defender Niall O’Sullivan deflected the shot over the bar at the expense of a point. Boherlahan pointed another free on the cusp of half-time to leave the interval score – Moycarkey-Borris 1-9 Boherlahan-Dualla 0-3. The second half was a much more even affair on the scoreboard as Moycarkey struggled to hit the target with the assistance of the wind. Moycarkey hit four wides from a variety of angles before they got off the mark in the second half. Moycarkey were still doing well in general play but a combination of wides from long range and dispossessions helped keep Boherlahan in touch and by the end of the third quarter, Moycarkey led by 1-12 to 0-7. Any chance of a Boherlahan comeback ended when Laurence Hickey was sent off in the 46th minute and from there, Moycarkey added five points to Boherlahan’s one to leave the final scoreline at 1-17 to 0-9. After some good results in the County Challenge Cup in recent weeks, Moycarkey-Borris will be happy to have transferred this form to the Mid Championship and earn a place in the next round. Their performance in the first quarter in particular laid the foundations for a good victory and the result was never in doubt thereafter. Over the course of the hour, Moycarkey hit 15 wides (12 in the second half) which illustrated their dominance. The starting line-up included five players from the side which lost narrowly in the County Junior A Hurling Final last November as Pat Molloy, William Dempsey, Paudie Doran, James Doran and Rory O’Regan earned promotion to the Senior ranks with the latter two players making the Senior Championship debuts. The defence did well throughout restricting Boherlahan to just three points from play over the hour. Rory O’Regan and Patrick Carey did well at midfield while up front, Kieran Morris took the scoring honours with nine points, 4 from play. Pat Molloy added three points while Rory Ryan contributed 1-1 as overall seven players got on the scoreboard in the absence of the injured David Sheppard. For Boherlahan this was a disappointing day at the office, in particular the opening quarter. The defenders worked valiantly throughout though under severe pressure while up front, they will need to ensure more of a scoring threat, in particular from open play.